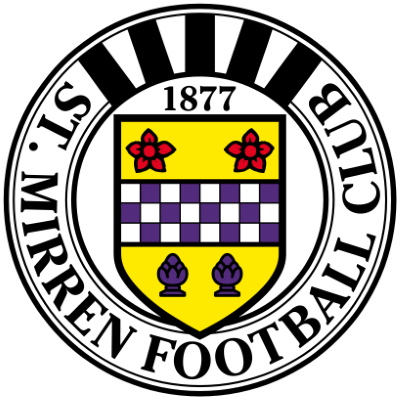 United’s recent good form came to an abrupt end with another disappointing defeat against league leaders St Mirren in Paisley. Two goals from Celtic-bound Lewis Morgan saw United fall to their first league defeat under Csaba Laszlo. United made only one change from the side which started the previous week’s victory over Livingston, and that was an enforced change as a fit-again Willo Flood came back into the side at the expense of the injured Fraser Fyvie. The game had appeared to be under threat due to the wintry weather which had affected the west coast of Scotland that day. However, despite the freezing weather and the conditions outside the ground bordering on treacherous, after an impressive clear up operation from volunteers, the pitch itself had no issues and the game was able to go ahead without any problems. 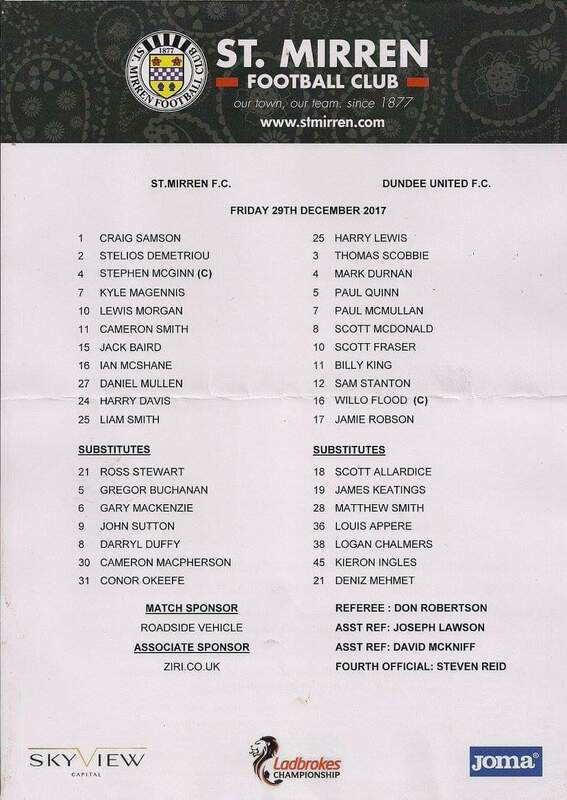 The away side started the game the stronger, and after a mere two minutes Paul McMullan broke down the right hand side, but his cross was deflected and ended up in the grateful arms of home goalkeeper Craig Samson. After nine minutes, the home side created their first chance of the game with Stephen McGinn having a low drive from 20 yards out, but Harry Lewis saved well. United wasted a great chance to take the lead after 13 minutes. 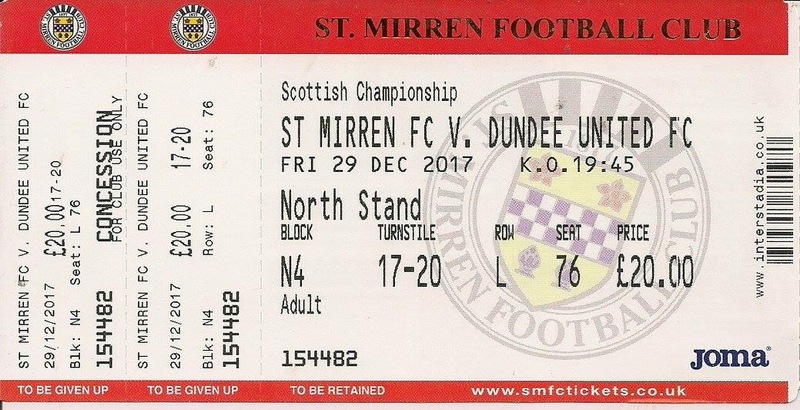 A cross from Scott Fraser caused chaos in the home defence, and as the ball bobbled around in the St Mirren penalty area Mark Durnan was fouled by Ian McShane and, for the second straight game, United won themselves a penalty. However, for the second straight game, that penalty was not converted. Paul McMullan took the kick, and although his penalty did not lack power, it was at a good height for Craig Samson and the St Mirren keeper was able to save. Although United continued to have the better of proceedings in the first half, chances were rather at a premium as all too often the final ball was lacking whenever a United player got anywhere near a promising position. United did force several corner kicks during the first half, but were unable to threaten the home defence from any of them. The first half by and large passed without incident, although Kyle Magennis was probably fortunate that the referee did not spot his stamp on Paul McMullan midway through the first half as the two players contested a loose ball. McMullan was able to continue after a lengthy spell of treatment. United did manager to create a couple of chances as half time drew nearer. On 41 minutes Scott McDonald had a great chance to give United the lead as he got his head to another excellent Scott Fraser cross, however he could not get any real power into his header and Samson was able to save easily. A minute later, Sam Stanton picked up a loose ball from Liam Smith. He drove towards goal before squaring the ball to Scott Fraser, who hit his left foot shot just wide of the post. Both sets of fans entertained themselves at half time with a snowball fight before settling down to watch the second half. 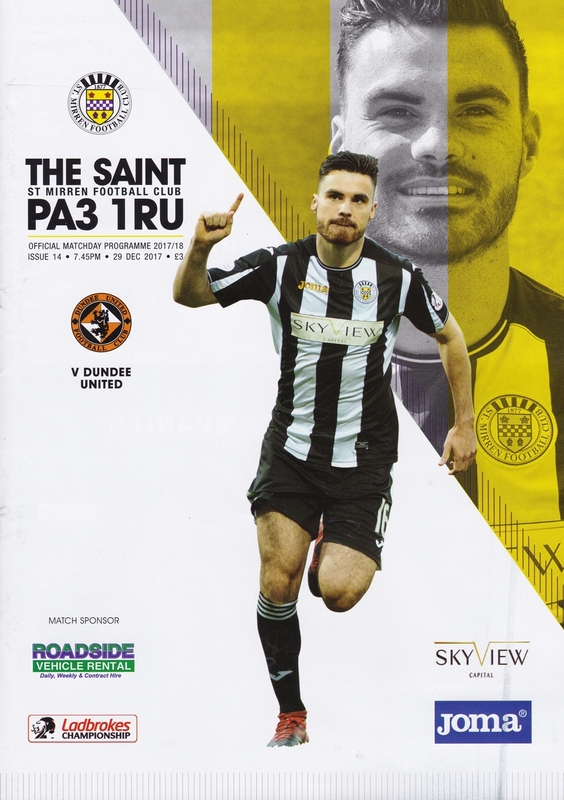 St Mirren started the second half as the stronger side, as Lewis Morgan hot a shot from just outside the area that flew past the post, before fellow midfielder Ian McShane did almost exactly the same thing a minute later. United did create a chance of their own when Willo Flood got into the St Mirren box and tried to feed Paul McMullan, but the home defence were able to block his pass and clear the danger. Five minutes into the second half, the returning Willo Flood injured himself blocking a St Mirren shot inside the United penalty area. He continued after another lengthy spell of treatment on his knee, although even after that he did not appear to be moving freely. Flood’s injury was to cost United as the home side took the lead just short of the hour mark. Lewis Morgan picked the ball up on the left hand side and almost without challenge he cut in towards goal. He took the ball past Paul McMullan and the struggling Flood and fired in a low shot from just outside the area that beat Harry Lewis at his left hand post to give the home side the lead they probably deserved on the balance of the second half. The goal was depressingly familiar to the goals Morgan had scored in the previous game between the two sides in Paisley, and as it turned out United had evidently still not learned their lesson. Flood obviously could not carry on, and was replaced soon afterwards by Matty Smith, but the damage had been done. The home side’s momentum was irresistible by this point, and as much as United huffed and puffed during the second half, they were being comprehensively outplayed by their energetic hosts. Morgan had another shot from outside the box after being fed by Cammy Smith, although the United defence were this time able to block his shot, before Kyle Magennis hit a fierce shot which went just past the post with Lewis well beaten. St Mirren sealed the win 12 minutes from time, and the goal had more than a hint of déjà vu about it. Mark Durnan conceded a free kick by fouling Cammy Smith around 40 yards from goal. Ian McShane played the free kick short to Lewis Morgan, who again was allowed to advance on goal almost unchallenged. Although he lost possession initially, the ball broke to Stephen McGinn who played the ball back to Morgan. He took one touch to control the ball and then he unleashed another shot from around 20 yards out. As with the previous goal, the shot beat Lewis low to his left hand post, and Morgan had grabbed his fourth goal in two home games against Dundee United. That goal killed the game, and saw many away fans heading to the exits. St Mirren did waste a great chance to make the margin of victory even greater in the dying seconds as former United loanee Cammy Smith ran clean through towards goal, although his shot was well blocked by the legs of Harry Lewis. The home side were forced to settle for a 2-0 win. The defeat meant that United went into the new year five points behind their opponents, although they did have a game in hand. 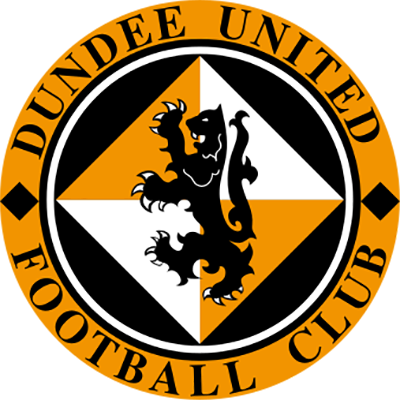 However, this was a desperately disappointing defeat after the momentum Dundee United had built up over previous weeks, although in truth the defeat was fully deserved as United never really caused their opponents any major trouble outwith that early penalty kick.